Streaming music services have gain tremendous popularity in recent years and become the most popular way to listen to music, among which Apple Music and Amazon Music Unlimited are preferable for a lot of people. Both Apple Music and Amazon Music Unlimited offer millions of ad-free songs to stream, but there are also differences between them. Amazon Music Unlimited comes with 40 million songs, ad-free, that can be downloaded to listen anywhere, while Apple Music gives listeners access to 45 million songs and premium sounding music. Furthermore, Apple Music is available in over 100 countries around the world with more coming online each month, which are far more than 28 countries that Amazon Music Unlimited launched. For various reasons, a great many Amazon users may turn to Apple Music and wonder whether there is any way to transfer songs from Amazon Music Unlimited to iTunes library. Here we are going to introduce one convenient way to export playlists from Amazon Music Unlimited to iTunes/ Apple Music. Like its competitors, Amazon also adopted DRM protection technology on all songs from Amazon Music Unlimited. So if you need to transfer Amazon music to other services, removing DRM from Amazon Music Unlimited is required. 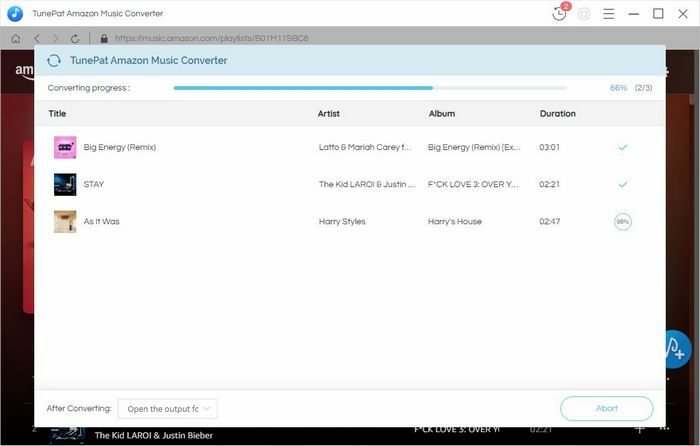 Here you are recommended to use TunePat Amazon Music Converter. 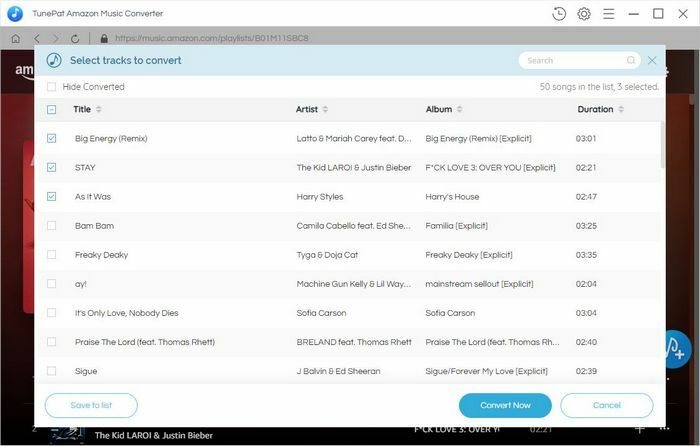 It is a professional Amazon Music converter, designed specifically for Amazon users to download or record any songs, albums or playlist from Amazon Music Unlimited to MP3/AAC/WAV/FLAC format without installing any extra software including the Amazon Music app. With the help of such a tool, you can easily get DRM-free Amazon music and transfer to iTunes library. TunePat Amazon Music Converter is available on both Windows and Mac computers, here we take the Windows version as the example to show you the detailed steps about how to convert Amazon music to MP3 and import to iTunes. 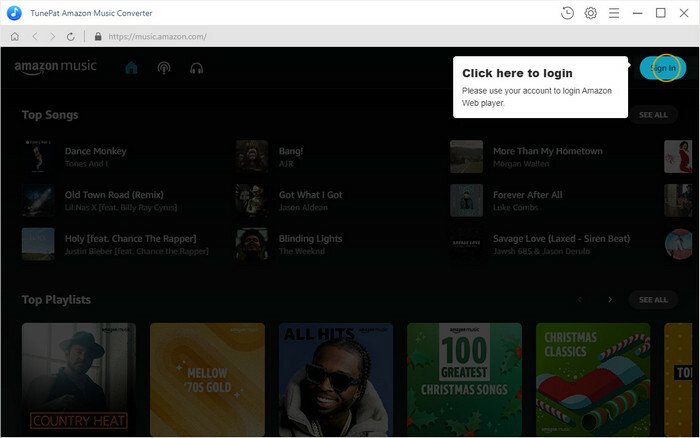 Run TunePat Amazon Music Converter on PC, then log in your Amazon music unlimited account. 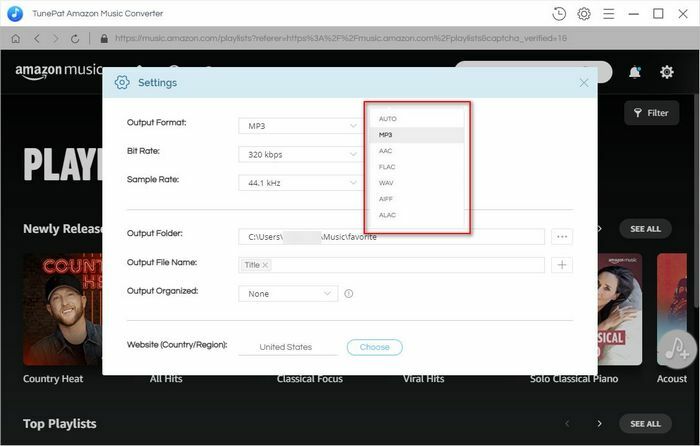 Click on the button on the bottom right corner to customize the output settings: Output Format (Auto/MP3/AAC/FLAC/WAV), Output Quality (256kbps, 192kbps, 128kbps) and Output Path. And you can choose your country/region here. Click on "Convert" button to start converting the Amazon songs to the output format you chosen. Once the conversion is done, you can find the converted Amazon songs in MP3 format by clicking the "History" button on the bottom right corner. Now please open iTunes, click Files > Library > Import Playlist to import the converted Amazon Music from the local folder to iTunes.